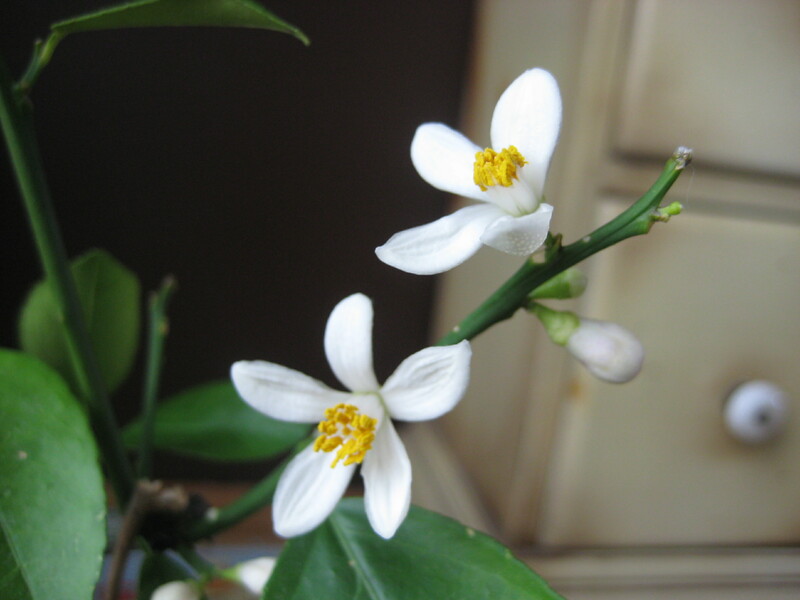 This entry was posted in Fruit and tagged dwarf meyer lemon, dwarf meyer lemon tree, growing lemons in Wisconsin, lemon, lemon blossoms, lemon tree. Bookmark the permalink. How wonderful to see those beautiful flowers in January! It’s amazing that the tree flowered, after looking so down and out. …..yet another lesson for all of us to ponder. I send Love and Best Wishes to you. What a beautiful winter surprise for you. I’m probably only three weeks behind you. I am still waiting for one of the buds to open. Please share other pictures if you have them. I hope you get some fruit! I have had a similar story here. I get plenty of flowers but the fruits don’t last long, and a majority of them don’t have a stigma. I also tried Dr. Earth and it was effective at making everybody want to move out of the house. Were you able to get some fruit to stay on the tree? The first year when I brought it home I got about a dozen lemons to survive to the eating stage, but since then none have survived that long. Mark, the first year we had two lemons and it hasn’t produced since! It currently has several potential mini lemons on it, but they do tend to fall off so I’m not holding out much hope. I will do a post on the lemon tree’s progress soon. And that Dr. Earth! Wow, I am so glad the smell of that stuff finally wore off and I can enjoy my lemon tree again, lemons or not.